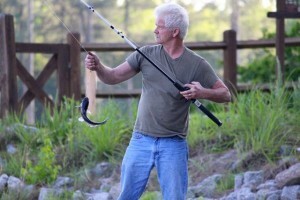 Hinson Lake in Rockingham is a popular spot for anglers to bait hooks and throw their lines in. 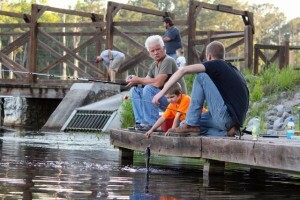 RALEIGH — Independence Day is free fishing day in North Carolina. 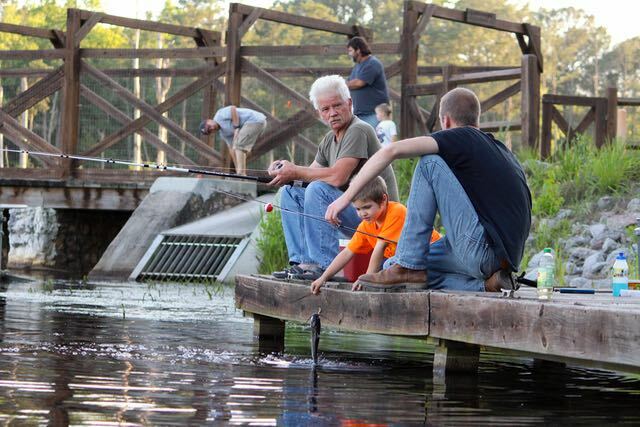 From 12:01 a.m. until 11:59 p.m. on July 4, everyone in North Carolina can fish in any public body of water without purchasing a fishing license or additional trout fishing license. Residents and non-residents can fish for free in public, inland waters, as well as coastal waters, although they will need to abide by all other fishing regulations, such as size and creel limits, as well as lure restrictions. The North Carolina Wildlife Resources Commission stocks a variety of fish in public, inland waters across the state throughout the year to give anglers a better chance of catching fish. Staff stocks cool mountain waters with brook, brown and rainbow trout, as well as walleye and muskellunge. In warm waters, staff stocks largemouth bass, American shad, striped bass, channel catfish and sunfishes. The agency also provides access to free fishing sites across the state, including public fishing areas and boating access areas. The interactive fishing and boating maps on the commission’s website list more than 500 fishing and boating areas, most of which are free, that are open to the public. * Visit a local Wildlife Service Agent. For more information on fishing in public, inland waters, visit the Fishing page.